Traditional metal braces are still the what people tend think of when they picture braces. Here, our Maple Ridge orthodontists tell a little about these classic orthodontic appliances. While you have braces you will need to visit your orthodontist on a regular basis for checkups and adjustments. But be sure to keep visiting your regular dentist, too! Cleaning your teeth properly becomes even more important when you have braces. Luckily, while you’ll have to take extra time and care, brushing your teeth with braces is quite easy… it just requires a little patience! 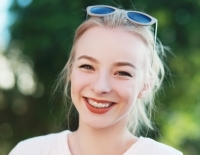 Lingual braces sit on the backs of the teeth and are proving to be very popular for people with concerns about the appearance of traditional braces. Depending on your preferences, you may want to highlight your braces, or you may want to hide them a bit. Here are some makeup tips to help you do either! Many orthodontic patients choose to have their teeth whitened after their treatment. Here, our Maple Ridge orthodontists explain why. With Invisalign, you can remove your aligners (trays) to brush and floss. The aligners need to be cleaned regularly too, so here's how to keep your Invisalign aligners sparkling. Healthy baby (primary) teeth help children chew and digest their food, and are one of the most important parts of their oral development as they grow up. Lingual braces placed behind teeth, effectively hiding them from sight. “Translucent” braces, which have brackets made of a tooth-coloured ceramic, blend in with the colour of your teeth. If you're wondering which option to choose, read on! What with school, jobs, hobbies and social obligations, most orthodontic patients lead busy lives that keep them away from home throughout the day. This list of essential and practical supplies is what you should keep on hand to care for your braces when you're on-the-go. Braces need to be cleaned thoroughly and frequently to remove plaque that can build up quickly in their crevices. An electric toothbrush can make brushing your teeth with braces easier and more effective. In-Ovation System self-ligating braces are great for adults and teens who want a more streamlined look, and gentler approach, to orthodontic treatment. Be sure to consider the following factors before choosing this option!